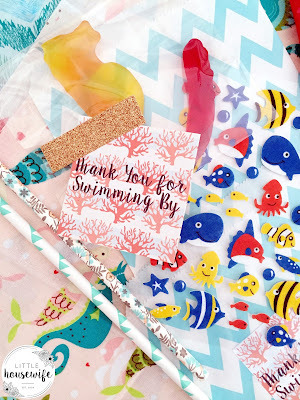 When I was planning Madeline's Mermaid Party earlier this year, there were no fish or ocean themed lollies to be found anywhere. Fast forward a few months and the good people at Allen's have just released a new range of treats called Sea Stretchies. My creative cogs started turning as soon as I saw them with all the really cool ways I could have used them. 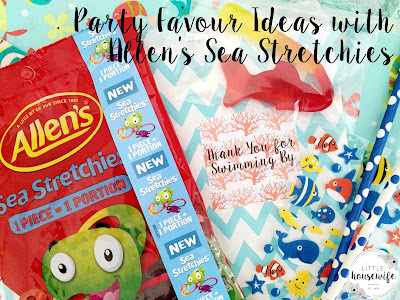 We all know that kids parties can really add up and one idea that kept coming back to me was that Allen's Sea Stretchies would make really neat and cost effective party favours! 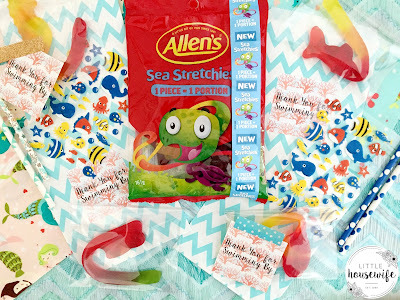 Allen's Sea Stretchies are generous in size, measuring around 16cm long (or the length of an adult hand) making one Sea Stretchie one portion for one person so they are a treat wise party favour to give out. 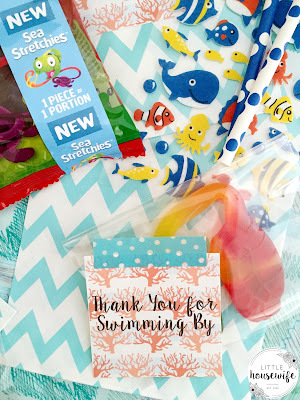 And there are seven Sea Stretchies in a bag making them a really cost effective treat too! 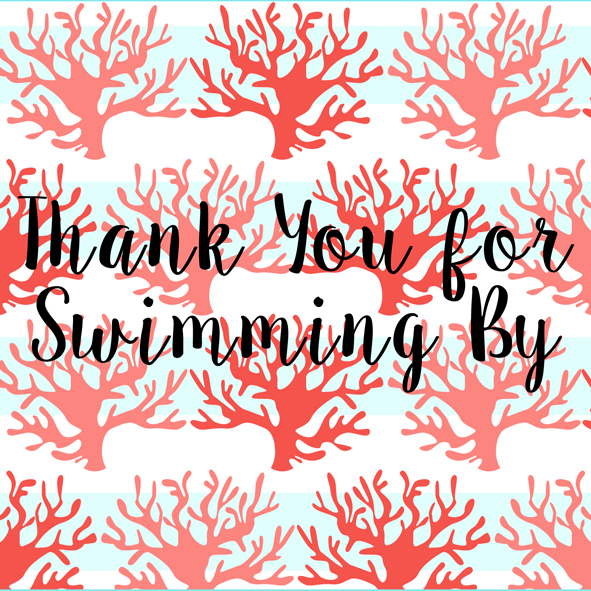 I popped each of the Allen's Sea Stretchies in a clear, self sealing, cellophane bag and created a wee thank you gift tag to attach. 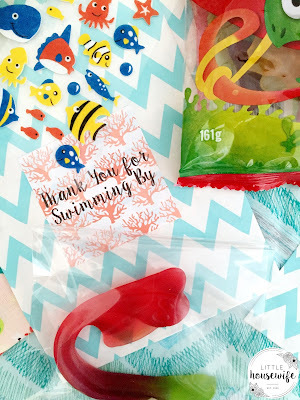 There were two ways I thought it could be attached - either by printing the thank you tags on labels and sticking them directly on to the cellophane bags or little paper bags. Or, if you don't have any printable labels, then printing on card and sticking it down with a little glitter or washi tape. A really simple, yet creative, treat wise and cost effective way to thank all your little guests for coming along to the party! And the kids will have a great time seeing just how far they can make the turtle, saw shark, sea horse and stringray stretch too! 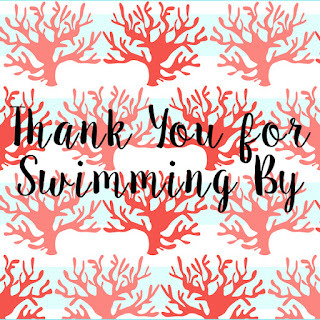 I thought I would share the free printable I created here in case you wanted to use this idea too. 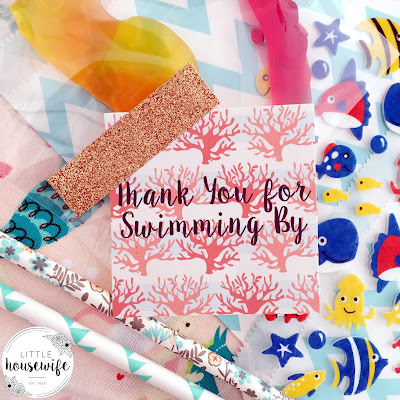 The coral with blue and white striped background make it ideal for both boys and girls and can we used for a variety of sea, ocean and mermaid party themes. Allen's Sea Stretchies are available at Pak N' Save and New World Supermarkets nationwide. Thanks to Allen's for letting us sample your new Sea Stretchies! They are o'fish'ally awesome!